With the writing prompt being Cemetery this week, I immediately thought of the cemetery plot that has me the most puzzled. 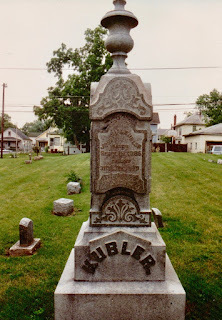 My second great-grandfather, Vinzenz Josef Kubler, died 19 September 1886 and is buried in the Connersville, Indiana cemetery aptly named City Cemetery. 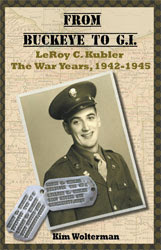 When I went to Connersville many years ago to research that branch of my Kubler family, I headed first to the local library. It was there that I found a newspaper article describing the death of Joseph Kubler, which is the name he went by in America. He died in the St. Gabriel's Catholic Church following Mass one Sunday morning at the age of 38. The librarian indicated that most residents of the town who died during that time period were buried in the City Cemetery. Unfortunately (at least at that time) no records existed to show where he was buried within the cemetery. After driving through the cemetery I did locate the tombstone for Joseph. It is to date the largest monument of any of my ancestors. On one side of the stone was listed Joseph V. Kubler, along with his death date and how old he was at the time of his death. On the other side was Alfred, son of J.V. & J. Kubler along with his death date of 3 October 1885 and the fact that he was 8 when he died. That is clear enough, but there are four other small stones on the plot: Father, Mother, Alfred, and Henry. 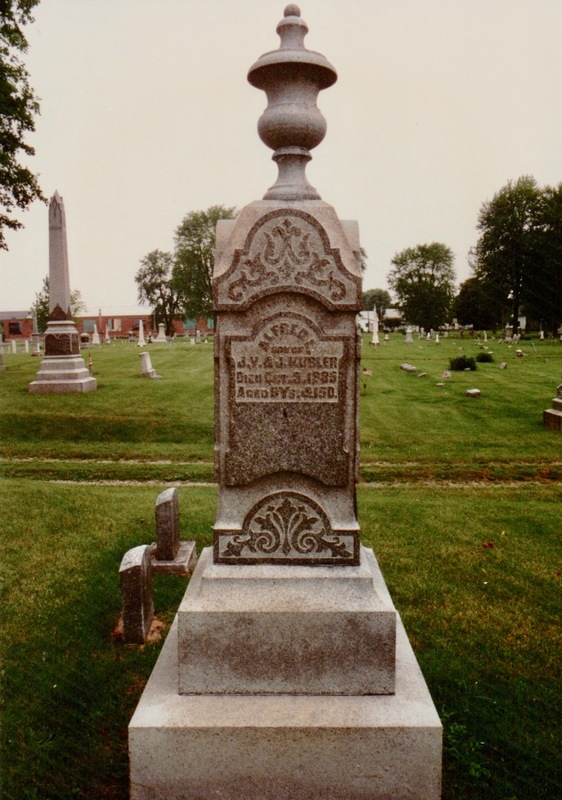 Alfred and Henry (my great-grandfather) were both sons of Joseph and Josephine Kubler. Initially I thought Father and Mother referred to Joseph and Josephine. However, I later discovered that Josephine remarried after Joseph died, and again following the death of her second husband. I would imagine that she was buried with her third husband and not her first husband. It is possible that they refer to Joseph’s mother and father, though the last records I have found for them are located in Cincinnati, and some of Joseph’s brothers had remained in Cincinnati as well. It would make sense that they would have their parents buried in Cincinnati. Unfortunately, City Cemetery does not have records that indicate who might be buried beneath those small stones. The other occupants of the Kubler plot remain a mystery for now. The writing prompt Storms had me a little stumped this week. I don’t know of any storm survival stories or storm chasers in my family, nor does anyone have a name that has anything to do with bad weather. But then I remembered my 2nd cousin, twice removed, Elsie Lauretta Metz. 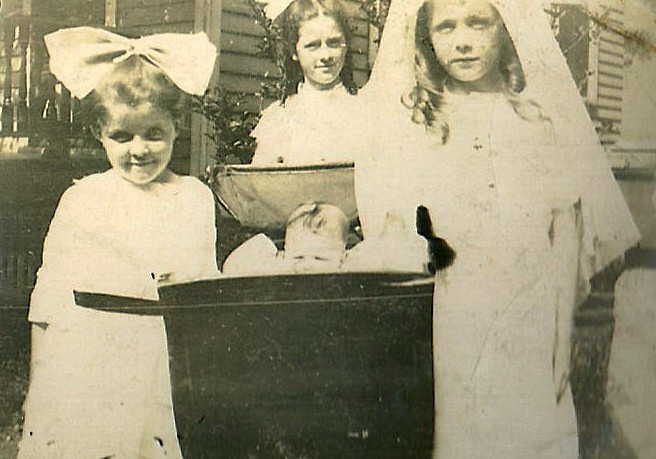 Born in Cincinnati on 24 May 1880, Elsie was the second and final child born to John and Isabella (Drescher) Metz. Their son Daniel was born in 1873. Elsie entered the University of Cincinnati (UC) in 1899, one of the 141 entering freshmen at a university of 1,145 students. She graduated with a bachelor’s degree in 1902. She received a teaching fellowship in Modern Languages at the university for the 1903-1904 school year. She would later be awarded a Master of Arts degree from UC. In December of 1911, 30-year-old Elsie applied for a U.S. passport, which was granted on 3 January 1912. 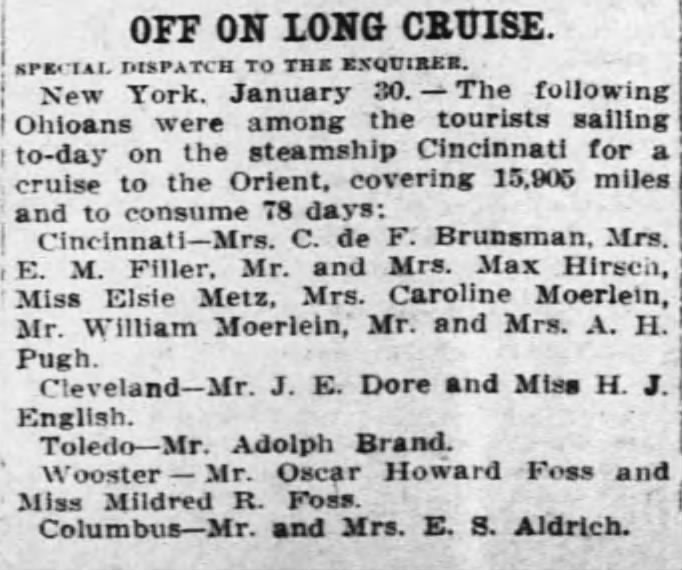 This was in preparation for a 78 day cruise to the Orient aboard the steamship Cincinnati. 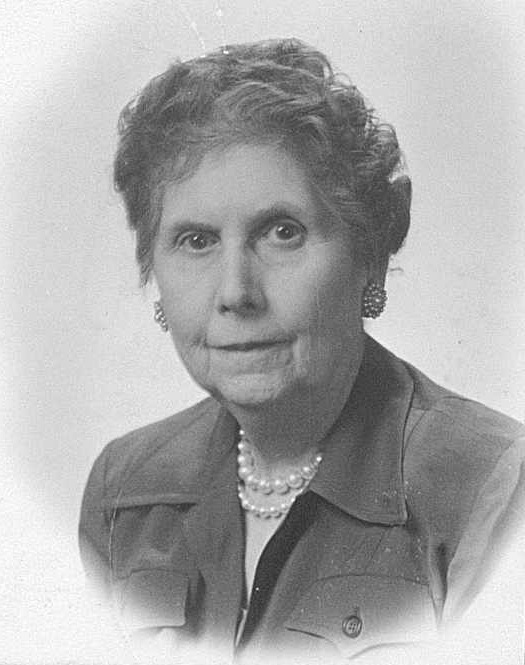 As a single woman, she traveled with family friends Caroline Moerlein and her son William Moerlein. The Moerleins were part of the Christian Moerlein Brewing Company dynasty. Elsie kept a diary of her adventure, which surfaced a couple years ago and was donated to the Cincinnati History Museum. I was able to scan the pages of the diary before it passed on to the museum. The beginning of the trip had a series of weather-related mishaps. The group first experienced ice and sleet on 28 January as they boarded a train in Cincinnati bound for New York City. There was more sleet when they arrived in New York on 29 January, and the Hudson River was frozen over as they made their way to the Vanderbilt Hotel. 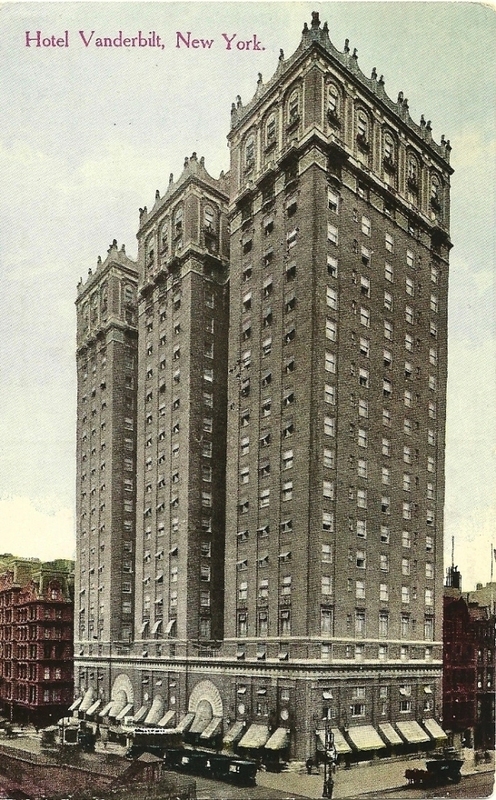 Newly opened on 10 January 1912, the hotel was built by Alfred Vanderbilt, great-grandson of railroad magnate Cornelius Vanderbilt. The sleet of the day turned into a blizzard by that night. 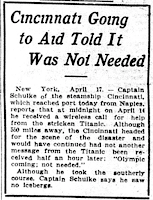 The Cincinnati left New York on 30 January, 1912. 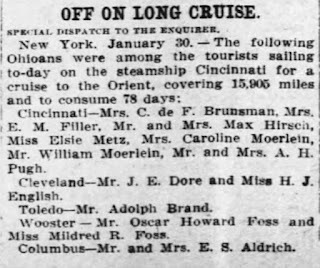 Elsie notes that they had “a rough stormy passage to Lisbon”, and that her female traveling companion was never able to appear on deck as she had “every disease known.” I’m sure that as First Class passengers, they were well taken care of, however. The ongoing storm was so bad that the ship was unable to land at Lisbon on 8 February, arriving the next day instead. Eventually they made their way to more temperate weather, and she does not mention any other bad weather before returning to New York on 20 May 1912. But, at least at the beginning of the trip, Elsie must have been wondering, what in the world have I gotten myself into? 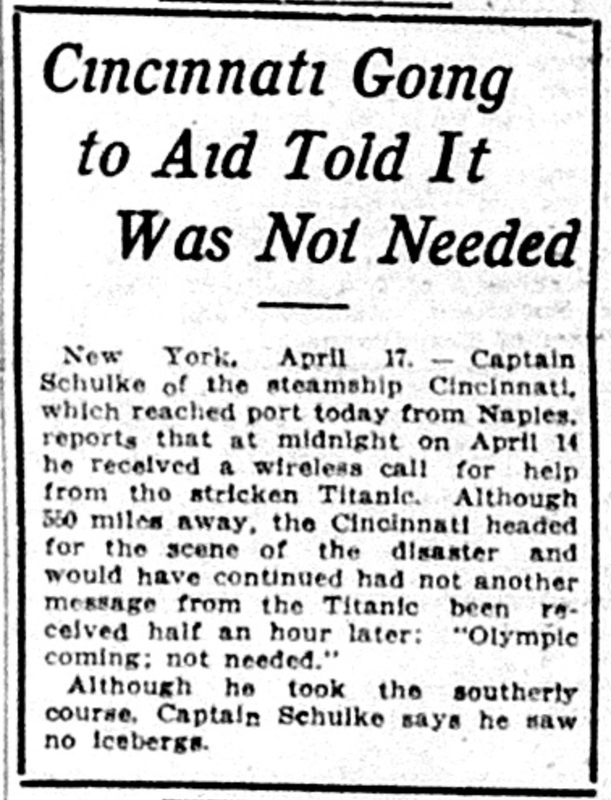 On a side note, Captain Schulke of the Cincinnati reported that at midnight on 14 April he received a call for help from the ill-fated Titanic. While on the way to offer aid, the Captain was told that his help was not needed so he turned his ship back to its original course. Elsie had many more traveling adventures in her life, including one where she had to get an emergency passport at the US Embassy in Berlin when WWI broke out in 1914 and she needed to get back to America. She died a spinster at the age of 93 on 21 March 1974. I almost didn’t write anything for this week as the prompt is Taxes. There are no ancestors that I know of who had any interesting tax payments, or who went to jail for nonpayment of taxes. I know of none who were tax collectors. 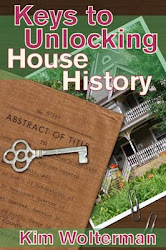 A suggestion was made to write about the ancestor who has been the most taxing, and for me that would be Thompson Hightower. But I have written extensively about the trials and tribulations I have had researching him. For me the most taxing (and frustrating) thing about doing genealogy is the fact that no one in my family is interested in my beloved hobby. Oh, they will listen when I tell them about a new discovery. And some are eager to see the family tree. But I read with envy the accountings of siblings or cousins or mothers and daughters who are on this journey together. In addition to halving the work load, how fun it would be to travel with someone who is as excited about finding a new birthdate from the 1800s or tromping through an old cemetery searching for a death date as I am! It has been a solitary pursuit for me, and I only hope that when I am gone all of my hard work doesn’t get tossed in the trash along with the other things that have been important in my life. 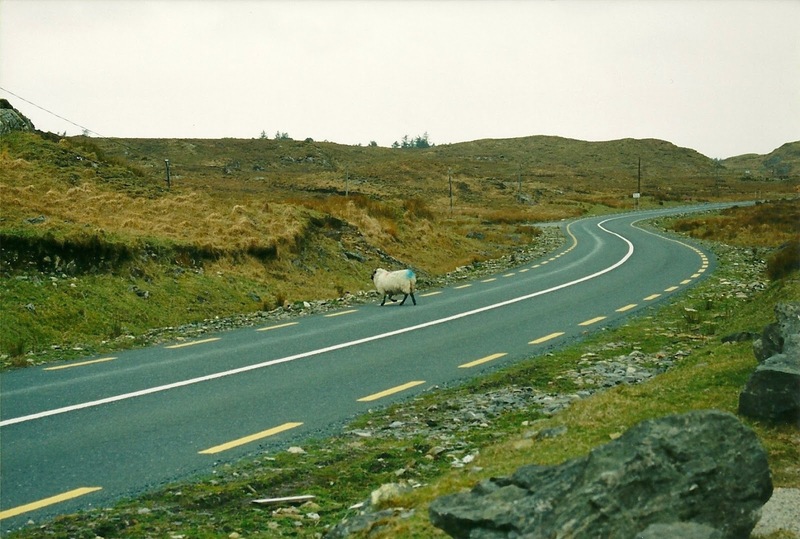 Maiden Aunt is the writing prompt for this week. The only aunt I had who never married was my mom’s sister, Marie. I wrote about her in Week 10, and that post can be found here. I had several maiden great-aunts, but the one that I knew the best was Dorothy Crusham. Born in Cincinnati, Ohio on 25 October 1908, Dorothy was the 9th and final child of Michael J. Crusham and Catherine (Colgan) Crusham. My maternal grandfather, Michael A. Crusham, was her oldest brother as well as the oldest child in the family. In the 1930 census, Dorothy was 21 years old, living at home with her parents and two of her brothers, and was employed as a telephone operator. Their house was located at 4117 West Liberty St. While she was busy with her life serving Christ, Aunt Dorothy (as we called her) tried to attend as many family events as she could. She particularly enjoyed coming to the Crusham family reunions, which were usually held in a local park during the summer. What I remember most about her was her smile and her infectious laugh. Although I don’t recall where we were going, one time I rode in the car with her. We were probably headed to my grandparents house after a family gathering. She was a horrific driver as she got older, and I vividly remember our drive as we headed the wrong way on a one way street. I was so frightened I got down on the floor of the back seat. We made it safe and sound to our destination, but my parents never let me ride with her again! 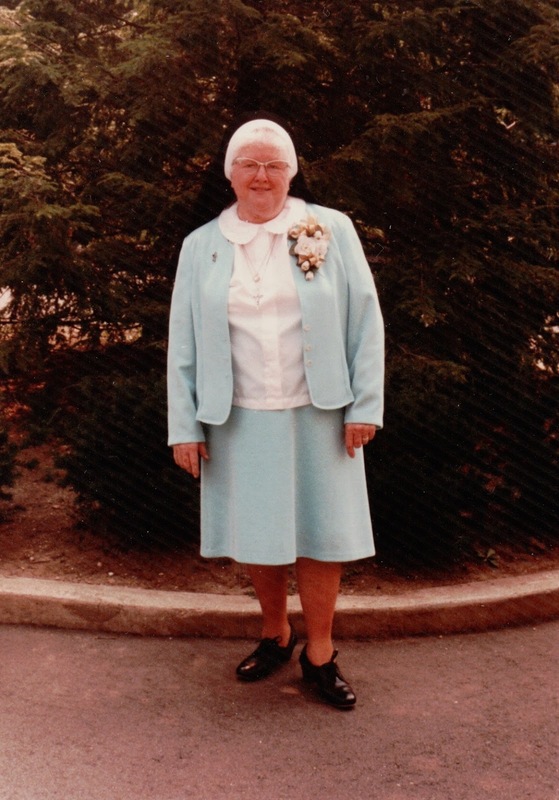 Aunt Dorothy was funny and kind, and I remember wishing I had nuns like her teaching at my elementary school in Des Moines. 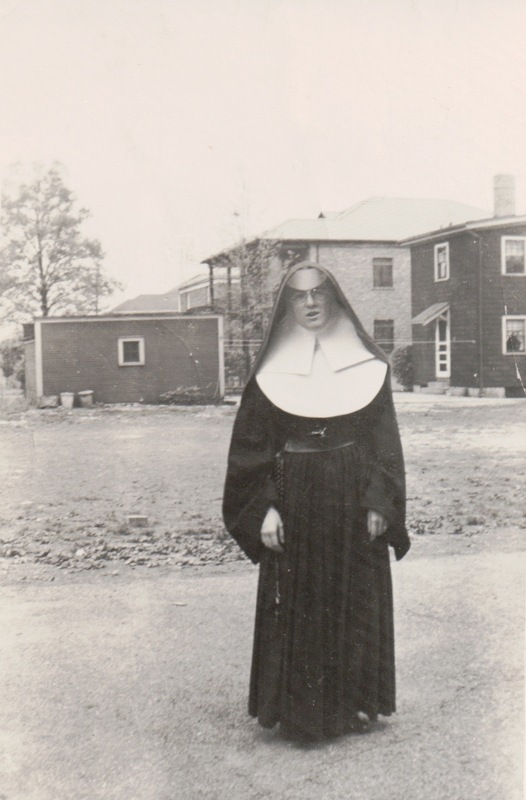 Despite the fact that she always wore a habit, she was not in the least bit intimidating. 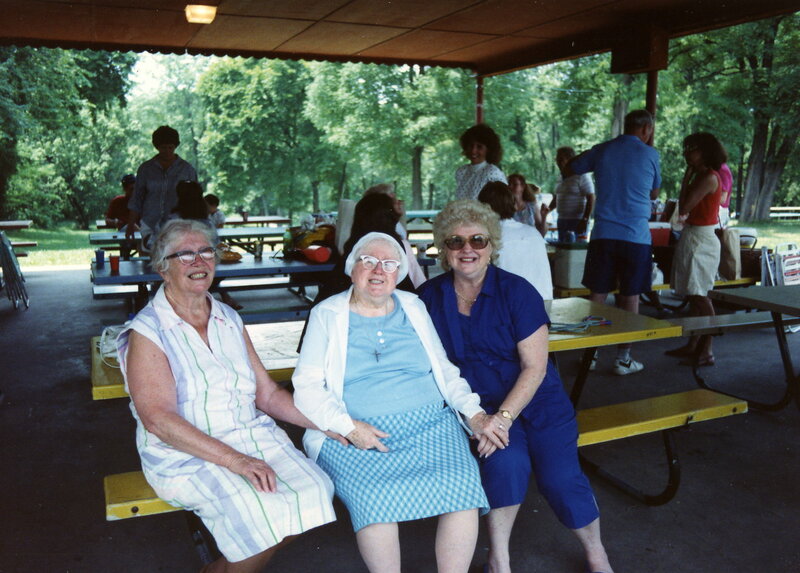 Her Golden Jubilee to commemorate 50 years as one of the Sisters of Mercy was held in 1984 at the Laurel Court in Cincinnati. Once the 1907 home of Peter G. Thomson, founder of The Champion Coated Paper Company, the building and its grounds were turned into an event space with multiple gardens. Many nieces and nephews attended the party, as well as her sole surviving brother, Tom. My brother flew in from Colorado, and my sister and her family along with my husband and me traveled from St. Louis to help her celebrate this momentous event. Dorothy died on 22 August 2001 at the age of 92. She lived a long, full life and was much loved by her spiritual and blood families alike.